You like us. You really like us. And we’re so glad that you do. With your help we’ve been named ConsumerLab.com’s No. 1 Rated Brand in the Direct Sales Channel Based on Customer Satisfaction. The incredible honor is based on the percentage of survey respondents who were “highly satisfied” with USANA. That means we must be doing something right. Right? We love to win awards. And we’ve done pretty well recently. In the past, we’ve received a top rating in 2011 for top Merchant in the Direct Sales Channel from ConsumerLab.com’s Survey*, as well as approval for several products. ConsumerLab.com is a well-respected organization whose mission is “to identify the best quality health and nutritional products through independent testing.” So when they say something about product quality it’s backed with a whole lot of credibility. But this is a very important honor because it’s based on what you think about what we do. It’s a glowing neon sign that says we’re living up to the promise we’ve made to you—that everything we do helps you love life and live it. And it all started with you. You are what makes USANA great. Your passion and ambition keep us pushing to be the very best we can be. You don’t settle, and neither do we. So we’d like to thank you for your inspiration and your votes. With your help, USANA broke a streak of nine straight wins by the previous winner. And with your continued support, we’re ready to start a winning streak of our own. Of course this is good news for the whole USANA family. But it’s especially good news for your business. You can use this, and other ringing endorsements, to share USANA with the people in your life. Because if you like us, then other people are sure to as well. *For more information see www.consumerlab.com/survey2013. SALT LAKE CITY, Feb. 4, 2013 /PRNewswire/ -- USANA Health Sciences Inc. (NYSE: USNA), a global nutritional company, has been voted 2012's "Best Company In Network Marketing" by MLM Insider Online. 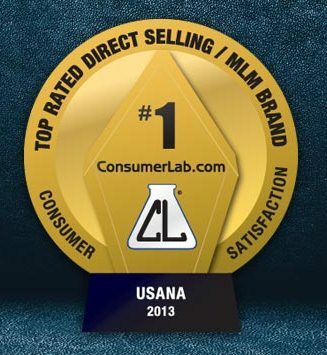 This is the 16th consecutive year USANA has earned the distinguished title during its 20 years of business. "To earn this title for the 16th time is a great honor and accomplishment," said Dan Macuga, USANA's chief communications officer. "To know our Associates support us is both gratifying and reassuring that we are doing everything we can to provide them with the information, tools and guidelines they need to succeed in the industry. We are appreciative of their continued support and enthusiasm toward the company." USANA, a longtime member of the Direct Selling Association, is also an active participant of the DSA Code of Ethics Communication Initiative, enabling the company to showcase its extra efforts and commitment to the Code of Ethics and the moral well-being of its Associates. MLM Insider is a respected online information source for the direct selling industry, providing educational, training and support information tips that are geared to both network marketing prospects and established distributors. Founded in 1992, USANA Health Sciences (NYSE: USNA) is a U.S.-based nutritional company that manufactures high-quality supplements and personal care, energy and weight-management products in its FDA-registered facility in Salt Lake City. USANA's products, tested by NSF International and used by more than 600 professional athletes, are developed by the company's award-winning team of scientists and sold directly to Preferred Customers and Associates in 18 international markets. Named one of Outside magazine's "Best Places to Work" for four consecutive years, USANA has received more than 100 state, national and international accolades, including Utah Best of State, Stevie Awards, Australian Business Awards, NutriSearch Editor's Choice and others. Learn more about USANA (www.USANA.com) and the USANA True Health Foundation (www.USANAfoundation.org/), stay current with the official USANA blog (www.whatsupUSANA.com), like us on the USANA Facebook page (www.facebook.com/USANAhealthsciences), or follow USANA on Twitter (@USANAinc). Sadly the most often-heard solution to this seemingly unsolvable situation is, "Go talk to more people...." So without knowing any better you follow that advice—you find a few more prospects, present the business a few more times, and try to help those new ones get started—only to see them eventually drop out too. What's going on here? Is the old "Bring 'em in the front door faster than they're leaving out the back door" antiquated approach any way to build a solid business? Well, the simple answer is, "No!" And yet to this day that same old mantra, "Go talk to more people...." is still being shared by many as the only solution to the dropout dilemma they're experiencing throughout the organization! Unfortunately, for most first-time business-builders, their eventuality is as predictable as it was preventable. The prediction, of course, is that far too many who've been sponsored will eventually quit the business—usually justifying their untimely demise because someone told them, "Network Marketing is a bad idea;" or they felt that "It took too much time and cost too much money;" or my personal favorite, "No one really helped me." And splat! You've lost another one... Road kill on the highway of success! No, I am not suggesting the "You just need to sponsor five prospects and teach them how to sponsor five more..." ill-advised plan either. Because if you truly want to succeed in Network Marketing, and achieve the top pay level in your company, an on-going sponsoring plan will need to become—like eating, or bathing, or dressing each day—simply part of the process of life. What I am saying (and have been for years) is prospects that are progressively educated about Network Marketing build bigger businesses, and in turn become better leaders, than those who are not. And yet to this day most well-intended business-builders still don't have a progressive plan in place for the initial (not to mention the on-going) instruction necessary for the survival of those they have personally introduced to their company. The truth is, above-average success in Network Marketing requires, among other things: 1) belief in the profession, 2) belief in the business-building system itself, and 3) belief in the fact that you can do this... Now if that's true—and it is—why do we seem surprised when those who haven't been progressively educated quit the business? On the contrary; if we're not systematically instilling this information into our new business-builders, we should actually expect them to quit as soon as they encounter any resistance at all—and we are rarely disappointed! Now that's how you build a bigger team!